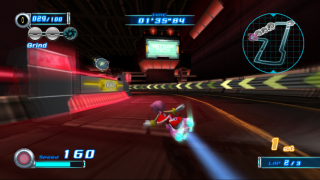 MeteorTech Sparkworks is the fourth level in the Babylon story of Sonic Riders: Zero Gravity. Amy Rose and Storm the Albatross find themselves separated from the rest of the heroes inside the vast MeteorTech factory, and have to flee through the glowing industrial facility to escape the pursuing SCR-GP horde. There is much of the same scenery as in MeteorTech Premises in the Team Sonic story: blazing alarms, giant gears, and inactive robots lining the side of the track. The 'sparkworks' comes from the electrified jump ramps that the Extreme Gear races can trick off, and land with an explosion of crackling electricity. Unusually, the player doesn't control one of the Babylon Rogues in this level, despite it being their story; instead taking control of Amy Rose. Amy has gotten separated from Sonic! Can she escape her pursuer, Storm, who is hot on her trail in search of the stone? Pursuing Team Sonic (or, more specifically, Amy's Ark of the Cosmos), the Babylon Rogues sabotage their infiltration into the MeteorTech factory by dealing with the defensive robots in an extremely ostentatious manner. The belligerent reunion between the two groups is then cut short as squadrons of angry SCR-GP droids descend on their position. Sonic, Tails, Knuckles, Jet, and Wave race off through MeteorTech Premises to escape; Storm, on the other hand, isn't about to let a legion of possessed robots derail him from the task of stealing the Ark back from Amy. When he blocks her path, Amy doesn't waste any time in dealing with the muscle-bound bird, smashing him over the head with the Pico Pico Hammer to prevent her from losing sight of Sonic. A disoriented Storm staggers after her into the depths of the factory.